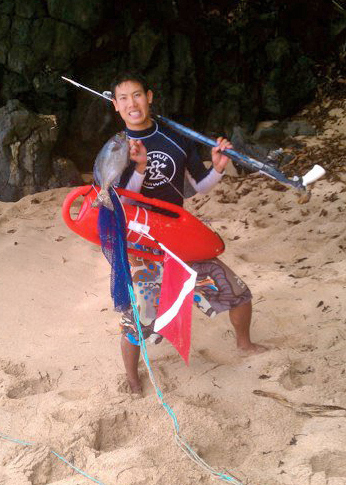 Team Cureus spoke with Austin Nakatsuka, about his poster research on redesigning football helmets, his spearfishing adventures and passion for helping underserved communities both at home and abroad. Austin is second year med student at the University of Hawaii-John A. Burns School of Medicine and volunteers at a rehab clinic working alongside his father for the past year at the Salvation Army Ola Kino Clinic in Honolulu. Mannequin gets helmet on helmet action in Austin’s experiment. One of the posters that caught the attention of Cureus members was Austin Naktsuka’s Redesigning Football Helmets To Reduce Concussion Risk. Not only is football the most popular sport in America, concussions have become a hot button issue for the NFL. The union and the league are both trying to find ways to change the culture of concussions from the grass roots up. 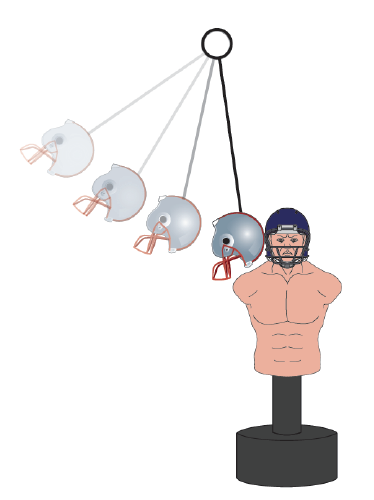 His conclusion is that adding a soft exterior layer of foam onto helmets can actually reduce the potential of concussion injuries on the football field. While we’re sure that the NFL is not going to return to leather helmets of old, as Austin would suggest, it will be interesting to follow how and if the league will make significant changes to their helmet design. Even though he called himself more of “an NBA guy” than a football fan, it was interesting to learn that Austin is very passionate about spearfishing. It’s one of the things that kept him sane through the rigorous program at the John A. Burns School of Medicine, University of Hawaii. We asked Austin what else he’s passionate about. He told us that “serving underserved” communities is a big part of what he does as a student with his father who set up a program for the Salvation Army which serves as a drug rehab center for the homeless as well as recently released prisoners. In fact, serving the underserved was one of the reasons he went into medical school. Austin washes the formaldehyde off with a vigorous spearfishing session. “I realized that medicine was a really great avenue mainly because you kind of have this unlimited potential to help people. I wanted to have as many skills and abilities as I could to serve people around the world,” Austin told Cureus. Austin admitted that volunteering at the clinic has been a great way to stay connected with the community and do what he’s most passionate about — helping people. Team Cureus asked Austin what he would want friends and colleagues to know about the John A. Burns School of Medicine. “We’re given a lot of clinical experiences. We do a type of learning called, “Problem Based Learning,” Austin said. “We base our learning around specific cases about patients that they have and so we can associate our learning to those cases. Our school does a really great job with that. “They also do a really great job of facilitating team work within, between classmates — kind of dampening down the competitive atmosphere and focusing more on an integrated togetherness sort of feel that I really like”. Austin added. Austin Nakatsuka is one of the 10,000+ members of our online Cureus medical publishing community. Check out his profile and the poster on football helmets he authored for our Fall 2012 Poster Competition.